What color is that dress after all? 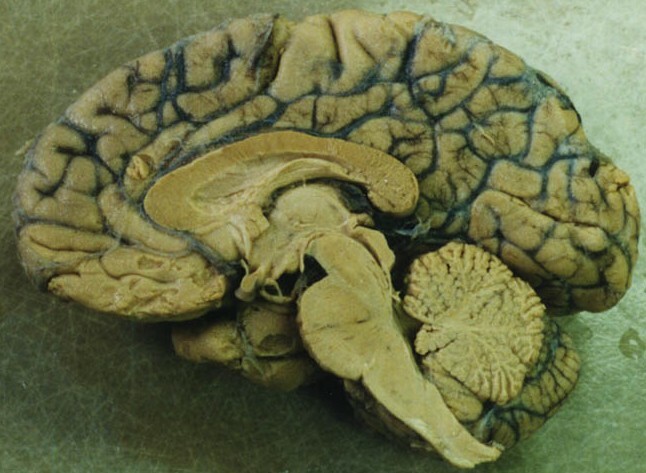 Answer: no color – The brain is sooooo cool! This image clearly shows a dress with stripes. The wavelengths and lighting are unusual in that they are perceived by some as a gold and white dress (me!!) and by others as a blue and black one. Unlike many “optical illusions,” this image is perceived as one color set or the other by most people. In other words, people are unable to switch between the two perceptions. The close cropping of the image prevents a person from globally contextualizing the dress. Is the dress drenched in light and therefore blue and black? Or is it in the shadows and therefore gold and white? The second explanation concerns the local context. 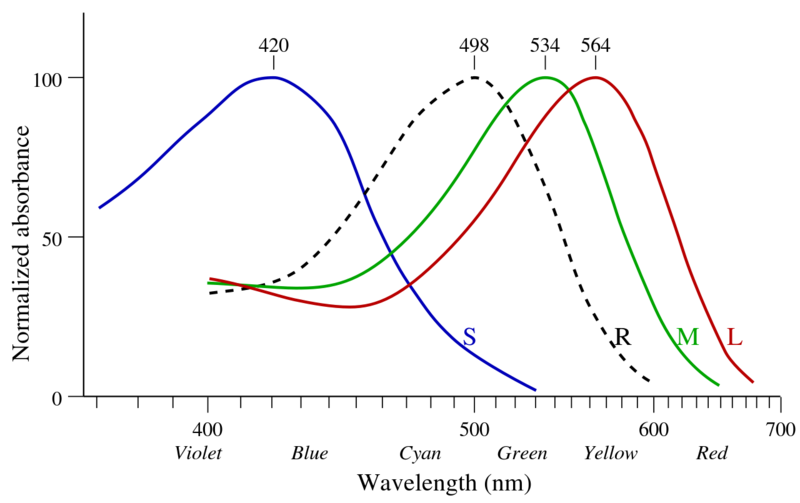 The same wavelength will be perceived as different colors depending on the surrounding wavelengths. You can see this for yourself in the articles cited above where cutouts from the dress image are perceived as different colors depending on the immediately surrounding wavelengths. Both of these points are valid and yet neither explains why some see the dress as gold and white and others as blue and black and most importantly why most people (including me) see one perceptual pair and are unable to see the other perceptual pair. The explanation that makes the most sense to me for this feature of the “illusion” was raised by Duje Tadin, Associate Professor of Brain and Cognitive Sciences at the University of Rochester in an article by Jonathan Mahler. Dr Tadin suggests that variation in the number of short wavelength cones that a person has is responsible for the different perceptions across individuals. Let me explain. We have three types of cone photoreceptors each of which has a preferred wavelength that it responds to. Short wavelength cones are not present in the center of the retina (the fovea) which contains medium- and long-wavelength cones (M and L cones, respectively) exclusively. Some may be wondering why I refer to cones as S, M, and L cones rather than the popular vernacular of blue, green and red cones. This is a very important point. Actually one could say that it is the critical point. There is a distinction between a stimulus and a perception. The stimulus does not predict the perception. Let’s put it another way. There is no color in the world. There is not even color in the retina. There is only color in our brains, in our neocortex even. What exists in the world is light that is characterized by a wavelength. Our neurons respond to light and our brain perceives color. Do we always perceive the same color given an identical stimulus? No. While there are many illusions of color perception, I want to use a different type of illusion to illustrate the difference between a stimulus and a perception. This one is taken from HM Burian (The objective and subjective factors in visual perception. J Assoc Med Illustrators 9:4, 1957) as reproduced in Chapter 2 (Binocular vision and space perception) of the 6th edition of Binocular Vision and Ocular Motility edited by GK von Noorden and EC Campos. 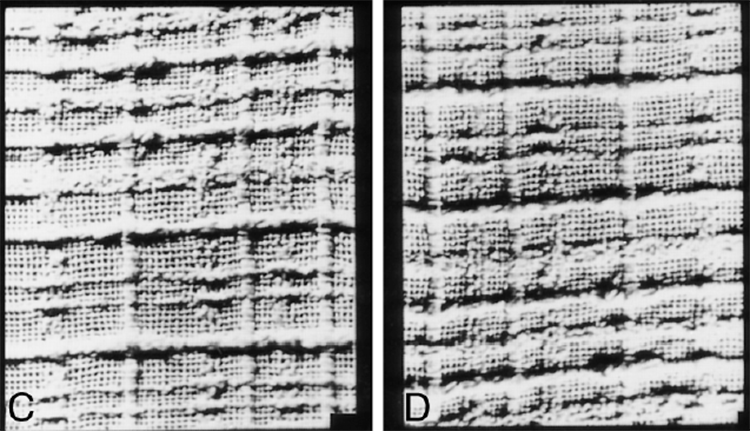 On the left you see burlap with depressed grooves and on the right you see burlap with raised ridges. This is an illusion that was originally made by HM Burian and reproduced in Chapter 2 (Binocular vision and space perception) of the 6th edition of Binocular Vision and Ocular Motility edited by GK von Noorden and EC Campos. This is the same image as above except the image has been flipped up-down so that up is down and down is up. So why do we interpret the same stimulus – let me repeat that, the same stimulus – differently simply based on its orientation. In this image, there is no context. So we read into this image that the lighting is coming from above because the idea that light comes from above, in the absence of any obvious artificial light source from below, is a well learned fact. Thus when a line of light is above a line of shadow, that light line is interpreted as sticking out to catch the light. In contrast, when a line of light is below a line of shadow, the dark line is interpreted as a deep feature that is in the shadow of the overhead light. So far so good. 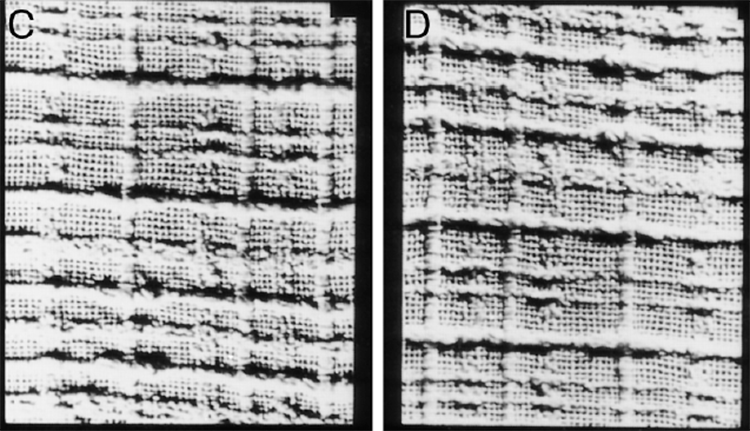 Another pair of flipped images from the same source as the image of burlap. 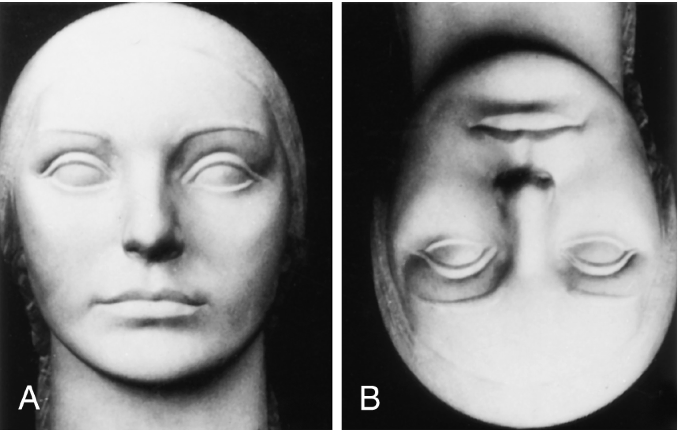 In both face images, the right-side-up one and the wrong-side-up one, we easily perceive that the image is a face. Moreover the nose comes out of the plane in both instances. What is the difference between these faces and the burlap? Well burlap can be ridged or grooved; we have no a priori ideas about burlap. On the other hand, faces are faces and noses come out of faces. So we simply see the face on the right as upside down but not reversed in depth. I do see the face on the right as deeper, less flat. I think that this is because there is a bit of the burlap effect above even when looking at a face. For example, take a look at the eyes, the lower right cheek, the neck, and under the nose. All appear darker and deeper to me on the right than on the left. I do not perceive the darker and deeper shadows as evidence that the face is inside out but rather that the face and head have more depth on the right than on the left. Let’s recap. What is out there in the world is light, light that has a wavelength. Within a range of visible wavelengths, light is a stimulus for the human visual system. What we perceive is color but the color exists only in our brains. Color does not exist in the physical world. Light does not have a color. Cones are not responsive to color. Color is a construction of neural circuits in the brain. And finally, let’s get back to that darned dress that caused all the hubbub. What color is it? Well the dress is not colored. Only our perception of the dress is colored. The particular colors that we perceive in the dress are subject to context, just as all perceptions are. 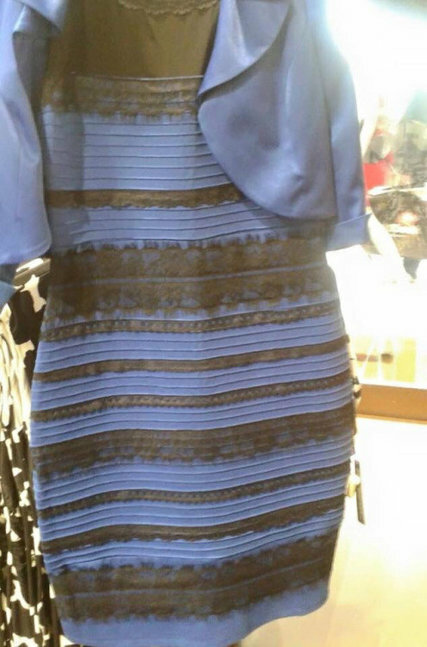 When the dress is placed in its full context, I expect that all will perceive the dress as blue and black!! But you, my esteemed reader, and I know, it just ain’t so. That dress has no color!! The dress will be perceived as blue and black by virtually everyone when seen within its full context. From the NYTimes. I only saw light blue and brownish gold in the cropped picture, not one of the “allowed” combinations! Thanks Peggy -the best piece I have read on ‘The Dress’! 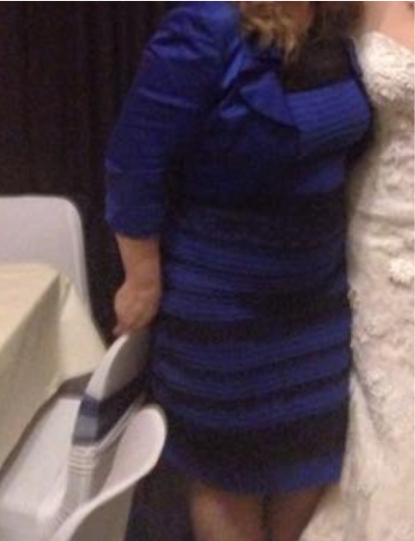 What I find strange is that the 1st day I saw the dress over and over; always blue and black. Then the next morning I was only able to see the dress as gold and white. Now I can’t see the gold and white again. Are others moving back & forth like this? Was it the exact same picture? Seems totally dependent for me on context/ lighting as I am not switching back and forth when viewing the same photo ( the way I easily do with other optical illusions). Perception is mostly context and expectation. When the dress come on TV I changed the station, until now. Thanks for this interesting bit of Science. Once I bought 3 pairs of identical pants ( same brand, material) in 3 different colors. However when I got home I showed them to my husband only to discover that I had bought 2 in the same color. So I went back to the store to make an exchange and as I brought them out of the bag they were again 2 different colors ( brown vs olive green). Lol. Particularly when I’m wearing what I’m thinking is a matching outfit, sometimes I’ve been surprised at the lack of a match when I leave the house and get under some different lights. Very funny. Thanks for that story. The vagaries of visual perception meet modern lighting conditions. I am impressed by the absolute certainty people have about whichever color the perceive the dress to be. “It’s obviously gold and white. How in the world do you think that’s black and blue?” We really trust our visual perceptions despite knowing how easily fooled they are. You write as though you don’t share that certainty. Hard to live without many leaps of faith such as 1) our perception of the world is accurate and 2) the next moment in time will happen, making it worthwhile to put one foot in front of the other and other myriad reactions. I don’t know how one would exist without these sureties. 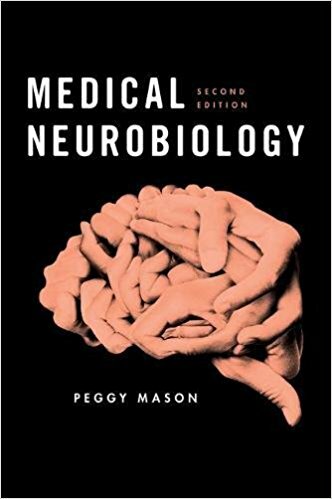 An excellent post by our favorite neurobiologist! Makes one wonder about eye witness reports that send people to jail. Indeed. Indeed. Can’t add to your perfectly succinctly worded concern. When I was in graduate school (back before the earth cooled), a white man ran into our class and threatened us “damned liberals.” Those students who had previously scored high on the F Scale saw the disruptor as black in much higher numbers than low scorers did. You are so right to wonder, Francine. Expectations and prejudices matter. I had to look up the F-scale and found out it is the “fascist scale” that rates authoritarian and conventional personality traits. So you’re saying that a white man disrupted your class and there were people who remembered him as black. These people were more likely to have scored high on “fascism” than people who remembered the disruptive man as white. Did I get that right? What a remarkable story!! What was class size and was this an intentional test on the part of the teacher? Pingback: Is the grass redder or greener on the other side? | The brain is sooooo cool! Ruth, we have something in common “back before the earth cooled” we have seen a few things…expectations and prejudices do matter and they don’t seem to go away. Dr. Mason does help keep my mind active. 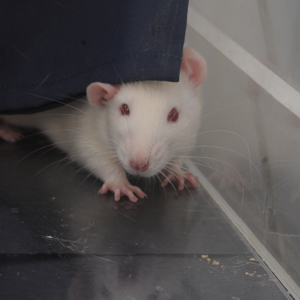 I am taking her course on Neurobiology coursa.org. Indeed expectations and prejudices do matter.